It is almost impossible that any of the Guantanamo Bay prisoners were armed when scuffles broke out as guards attempted to transfer them from communal living quarters to individual cells, Cindy Panuco, a lawyer representing a Gitmo detainee, told RT. US Military guards at Guantanamo Bay fired 'less than lethal rounds' when prisoners from Camp 6 – a medium-security building which houses 80 to 100 detainees – allegedly fought back with makeshift weapons on Saturday while being moved. While the US Military accused the detainees of covering surveillance cameras, windows and partitions to prevent guards from observing them during their two-month-plus hunger strike, Panuco said the real point of the move was to break the prisoners' resolve. RT: Was your client involved in this alleged scuffle? Cindy Panuco: I represent [Afghan detainee] Obaidullah, and given the restrictions on our communications with him as his Habeas [Corpus] attorneys, we have not been able to be in touch with him to find out whether or not he was involved and whether or not he is doing okay. Our understanding is the same as yours. It’s what’s gone out and what’s been provided to the media, that he has been placed into isolation along with everyone else. RT: We're hearing the inmates responded with makeshift weapons. How desperate are they to fight back despite the conditions that they must be under at this point? CP: Well, it’s interesting to find out that they have makeshift weapons. Whenever we have gone down to visit our clients, the only things that they are allowed is small ballpoint inserts of a pen. They’re plastic, little, almost like straws with ink at the end of them. That’s pretty much all they’re allowed, so I don’t see, especially given the invasive searches that were conducted in February, what kind of makeshift weapons the government is referring to. That’s still to be determined, especially since there’s no way they could have any sort of weapons. RT: Why do you think the authorities are trying to isolate the detainees at this point? CP: Well, they [the US Military] are claiming that it’s to be able to monitor their health. But probably, if you asked our clients, this is just another measure that they’re taking to make it more difficult to endure continuing to starve themselves and continuing to protest. If they’re together, if they’re in communal living space, they can communicate and at least support each other. And now that they’re being isolated, it’s another form of torment. To be taken away from your other friends and comrades who are there with you, it makes it much more difficult to endure what is already a very difficult situation. RT: For weeks, the US Military has allegedly played down the scale of the hunger strike. Do you think there will be more scrutiny now following the latest incident? CP: I hope so. At last count by the US government’s numbers, there were about 43 men on strike. 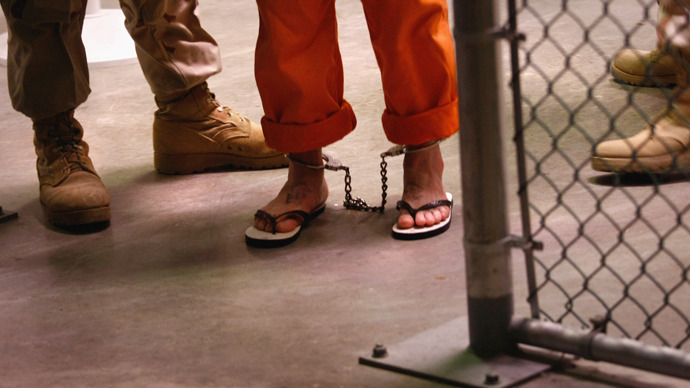 My co-counsel who represents Obaidullah [Derek Poteet] visited him just two days ago at Guantanamo. Obaidullah described Camp 6 as looking like a village which had been decimated by some sort of attack, with men just walking around very feebly, very weak, barely able to have any energy to even communicate with each other. It’s a very, very sad and difficult situation, and the reaction of the US is the opposite of what it should be. This strike, the protest, it could have been resolved not with violence, but by simply agreeing to allow the men to return the Korans to the US government; to surrender them so that they did not have to watch them continue to be desecrated and searched. RT: Do you think there is an end in sight to this hunger strike at any point? CP: Sixty eight days now our client has gone without taking any food from the US authorities, and it appears that rather than do something as simple as allow them men to surrender their Korans, they are instead isolating them, resorting to firing rubber bullets at them and resorting to tying them down and force-feeding them with tubes up their noses. It appears that, unless there is [more] international pressure, then the protest will continue and the US will continue in actions that will be retaliatory.